The podcast about all things architecture. Archispeak is a casual conversation about all things architecture, and we invite you to listen in as we talk about everything in the profession, both the good and the bad. Think you already know what architecture is really about? Tune in to find out. Archispeak looks back on the first full day at the AIA Convention in Atlanta, which included some inspiring and not so inspiring Keynote speeches headlined by former President Bill Clinton. We also discuss the results from the NCARB Task Force and their stand on the use of "intern" plus a look at the Death of the Tweetup. Comment Rules: Be cool like the Fonz. Critical is fine, but if you’re rude, we’ll delete your stuff. Please do not put your URL in the comment text and please use your PERSONAL name or initials and not your business name, as the latter comes off like spam. Have fun and thanks for adding to the conversation! 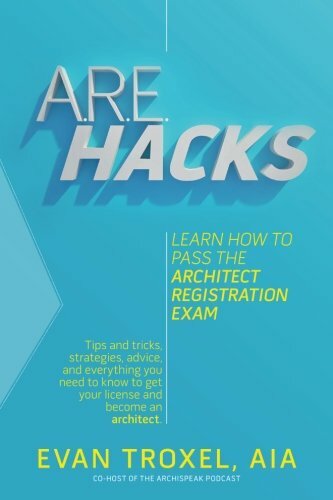 Co-host Evan Troxel wrote a book to help you become a licensed architect. Level up!